A wheelchair ramp can be temporary or permanent depending on how it’s used. There are many areas in a home where a wheelchair ramp can provide useful. In the bathroom, a ramp can allow for the user to roll into their shower or bath. For the front entranceway, a ramp provides accessibility and independence when entering a home. In a wheelchair van, a ramp is used temporarily to let off the wheelchair passengers and then put back into the vehicle. In certain buildings where there is frequent use, a permanent solution is more desirable. If you are looking to build a new handicap ramp, make sure it complies with the ADA federal requirements for a handicap wheelchair ramp. The maximum slope of a ramp in new construction shall be 1:12. This means for every 1 inch of rise, the run or the length of the ramp must be 12 inches. If the rise is 2 inches, then the run must be 24 inches, and so on. The maximum rise for any run shall be 30 in (760 mm). Aluminum is the most favored material for use in wheelchair ramps because of its durability, the portability and resistance to rust. Aluminum wheelchair ramps are also the lightest of the other commonly used materials. Wood ramps are cheaper but are not as durable. Steel is durable and heavy but it requires more construction work. 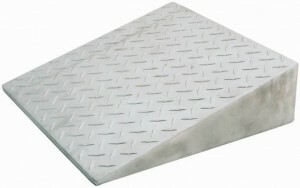 All materials can support heavy unloading but only aluminum ramps can have the durability without the extra weight. I would also look for a ramp that has a slip resistant surface, great for rainy days. Here are some recommended wheelchair ramps that are able to support the demands of a wheelchair user. The widths of these wheelchair ramps are 30 inches and lengths can range from 2 feet to 12 feet. Useful for doorways and raised landings. Aluminum Doorway Ramps – Choose from many different heights. Although the requirement for most ramps is a ratio of 1:12, for some wheelchair users with upper body disabilities and poor stamina, this incline could be too steep. A 1:16 or 1:20 ratio might be more suitable. Remember to design your ramp for the user and you will always end up with a satisfied customer. Make sure to ask these simple questions regarding their physical abilities. Do your arms get tired easily? Are your arms capable of climbing these inclines? Are you able to maneuver around your home independently? Find the wheelchair ramp that meets your needs.